Google AdWords has become a better deal for marketers lately. Based on the AdStage data, AdWords CPC decreased 42% in the fourth quarter of 2017, while CPMs decreased 30% QoQ and CTR increased 21%. That’s certainly great news, but it doesn’t mean making your AdWords campaigns profitable has become a cakewalk. Hardly. It’s still expensive and ferociously competitive. And unless you’re willing to become AdWords-certified, just using the AdWords platform can be a little intimidating. But having profitable campaigns may be easier than you’d like, especially if you’re willing to learn a few hacks. And that’s exactly what we plan to show you here. These are all simple, powerful changes almost anyone can make to their AdWords account. They don’t take days of work to do. And they could very well double your profitability. 1. Get your tracking right or go home. We don’t mean to be harsh, but if your AdWords account is not correctly tracking conversions, there’s little point in optimizing anything until you get that right. 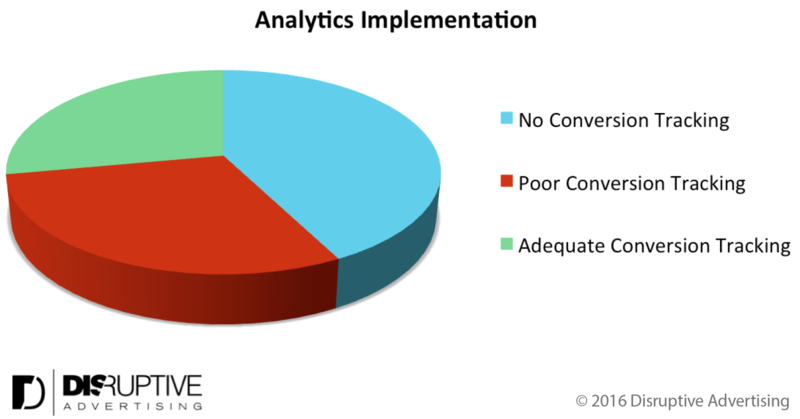 This seems simple enough, but 42.3% of AdWords accounts have no conversion tracking set up at all. Even among accounts that did have some kind of tracking set up, only about 29% have their tracking correctly set up. This is so important, I’ll say it again: Only 29% of AdWords accounts have their tracking set up correctly. So while this might seem like an obvious, no-brainer tip, it clearly needs to said. You’ve got to get your tracking set up correctly. Otherwise, you’re basically throwing money away. And so yes, simply by getting your tracking set up correctly, you could easily double your AdWords return on investment. It’s not even all that hard. Google’s instructions for how to set up conversion tracking are here. It is a big page, but note that there are instructions for how to track everything from phone calls to app conversions. 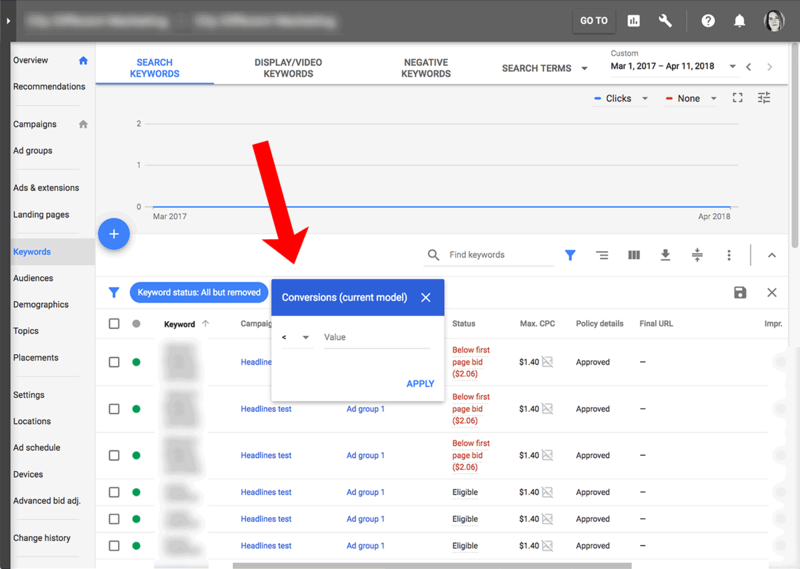 Now, some of you will question the idea of trying to track conversions via AdWords because you may not be able to track those conversions all the way through to the end of your company’s sales funnel. B2B marketers with really long sales cycles (three months or more) often have this problem. But that doesn’t mean you shouldn’t assign some value to whatever happens when people complete the call to action your ads are driving. If you’ve got a complex sales cycle – yes – assigning value to conversions near the top of your funnel can be complex. You are going to have to do some careful analysis to get a realistic value for those early conversions. But just because it’s hard doesn’t mean it’s not worth doing. Think of it this way… if you’re spending $1,000 a month on AdWords, and you don’t have conversion tracking installed, you’re wasting at least one-third of your ad spend. Your resistance to setting a value for your early conversions is costing you $333 per month (or more). Want extra credit? While you’re setting up tracking, add the AdWords remarketing tag to your site, too. It’ll come in handy later. 2. Stop spending money on keywords that don’t convert. Once you have conversion tracking working properly, the fun really begins. After your account has accrued data with the new tracking information, you can finally go in and start seeing where you’re losing money. Most advertisers like to start with keywords. So create a filter to show the keywords in your account that have never (or not recently) generated a conversion. AdWords would then show you all the keywords that haven’t generated any conversions in this timeframe. If you’ve never done this before, and you have a good amount of conversion data, you’ll probably see at least a few keywords that you’ve spent several thousand dollars on that have never generated a conversion. Take a moment to feel the pain, then pause those keywords. Move on. Think about which negative keywords you pick carefully before you add them, but do add them. They can make a massive difference in profitability. I more than doubled the return on investment for a small law firm’s AdWords account a few years back, just by adding a couple of negative keywords. I was checking out what their competitors were doing and searched for “new mexico adoptions” myself. There were a slew of ads for child adoptions… but also quite a few for dog adoptions. After we added “dog” and “dogs” and other pet terms as negative keywords for this adoptions ad group, the law firm’s ROI for that ad group spiked. 4. Stop spending money on locations and times that don’t convert. Want to stretch your ad budget? Trim when and where you show your ads. Try running both reports so you can see whether it’s worthwhile to turn off an entire day (or days), or if it’s more frugal to turn your ads off for a few time blocks during the day. B2B marketers will often discover that they’re getting the bulk of their conversions during the week. And yet, they’re still spending money over the weekends. 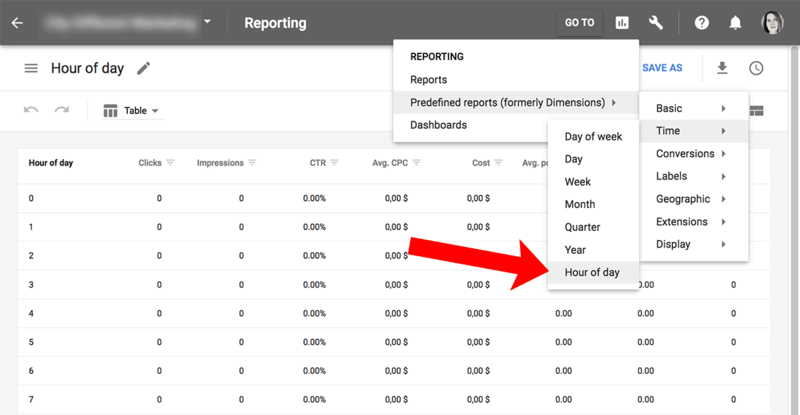 So if you’re seeing red messages in your AdWords campaigns that say you don’t have enough budget, or you simply want to increase the profitability of your campaigns by 20-30%, try running these two reports. You may be able to cut your ad spend by 30-40% or so, while losing only 5-10% of your conversions. Want to learn more about how to optimize your AdWords campaigns based on their hourly performance? See our article, “The 10 Best AdWords Scripts to Scale your PPC Accounts.” It discusses two scripts that could make your time-optimization work easier. 5. Beware of the Display Network. Are you running ads on Google’s Display Network? Do you know where those ads are running… exactly? It might be worth a look. Go to Display Network > Placements to see where your ads are running. Sort by clicks. Then actually go to the top ten sites listed. Are those the types of sites you really want your ads to be seen on? Sometimes, the answer is yes. But often, advertisers are kind of appalled by what they find in this list. The trouble is, your ads are probably showing on thousands of similar sites. This isn’t just a branding problem. It’s also a click fraud problem. And as you probably know, click fraud is a serious, widespread… black hole for money. Even if you’re getting conversions, most of those conversions could be fraudulent. So how to fix this? Duplicate the campaign, erase all the display placements Google has given you, and start with your own list. Have an intern go find a list of the top 500 most-visited sites on the internet. Then – with judgment – add those sites to your display placements. Next, go in and add about another 100 of sites in your industry or niche. You can also cherry-pick some sites that Google included in their site placements, but just be really picky. Once you’ve got your “safe list” of sites, turn the campaign on and see how the two campaigns run for a while. If possible, track how these early conversions in AdWords convert into actual sales. You may find that you’ve been spending a truckload of money on the display network for barely a wheelbarrow’s worth of actual business. But as the display network is a valuable tool, we don’t want to lose it entirely. It just needs careful management. Want to learn another workaround for spammy sites in the Google Display Network? Listen to our podcast episode, “The Rise of the Technical Paid Marketer” with JD Prater and Gianluca Binelli. 6. Use landing pages. Then use more landing pages. You’ve heard about how it’s important to use landing pages for your AdWords ads, right? ‘Cause it’s basically AdWords 101. So are you… um... actually using them? This tip is a bit like the advice to track your conversions. It’s drop-dead obvious, everybody knows about it… and yet, only half of the marketers make a new landing page for every new campaign they run, according to HubSpot. You need to be in that half. And actually, you want to do better. How well your landing page aligns with the keywords you’re bidding on, your ad copy, and your searcher’s “intent” (what they’re looking for), the better the Quality Score for your ads will be. And as you probably know already, your Quality Score has a massive effect on how much you pay per click. But just as importantly, how targeted and optimized your landing pages are will also affect your conversion rates. Just to make an estimate, if you’re not using landing pages for your ads right now, you could almost certainly double your conversion rates simply by creating a landing page for every 3-4 ad groups in your account. We won’t even add how much you’ll save with the better Quality Scores, but that could easily double your ROI again. 7. Take your best-performing keywords and create a dedicated ad group for each of them. Several years ago, when I was managing $12,000 a day in AdWords spending, this was one of my best secret weapons. · Most of your ad spend and your profitability is probably running through a small group of keywords. · These keywords are ultra-valuable. They deserve vastly more attention than your other keywords. · Giving these keywords their own ad group means you can split-test the bejesus out of those ads, and create ads solely for those very special keywords. · It means you can create landing pages only for those very special keywords. · It means you can direct the bulk of your budget into those very special keywords. You can’t do this for your whole account, but try to do it for at least your top ten to twenty best-performing keywords. It can easily double your ROI, if not 10x it. Bonus: Try Google’s retargeting features. Still not sure you can make AdWords profitable? Then get ultraconservative and stick to their remarketing lists for search ads (RLSA). This is basically a way to show your AdWords ads only to people who have come to your website. You can even show ads only to people who have looked at specific pages on your website. You take that audience of people (who have been to your site) and then only show your ads to them right after they’ve searched for a particular list of keywords that you define. This is genius because (as you know), people rarely buy the first time they visit a site. But as you build brand affinity with them, the chances they’ll convert skyrocket. It’s not uncommon for conversion rates to double, triple or more. And so, using RLSA for your ads could mean you easily double your ROI. Google’s RLSA page is here. You’ll need to install that remarketing tag we mentioned earlier to make it work. You can learn how to create a remarketing list in your AdWords account here. Try it. If it works even half as well as it could, you’ll have an ROI even a casino would envy. Know of any AdWords hacks that can be implemented fast and double a campaign’s ROI? Tell us about them – even just one – in the comments.